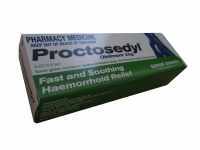 Proctosedyl ointment is distributed by Sanofi-Advantis. It is available in very few pharmacies. * It helps with the healing process due to fissure hemorrhoids. As you can see from the formula above. The fact that it contains a topical corticosteroid and a anesthetic makes this an excellent formula to help with getting rid of very complex cases of hemorrhoids and fissure hemorrhoids. A topical corticosteroid has antiflammatory, antipruritic and vasoconstrictor actions all in one. This is exactly what is needed for hemorrhoids cure. As hemorrhoids have these same related symptoms. What all this means is that it will get rid of the pain associated with the inflammation, stop the itching, burning and cure the hemorrhoids. Plus the pain will also be reduced due to the local anesthetic in the formula. IMPORTANT: Before use, always read the product information supplied in the box: The directions, The Warnings, The Side Effects, The Overdosing, The Contra-Indications and any other Important information supplied example: if it is contraindicate if you are pregnant. N.B. If you are allergic to cortisone, and many people are very allergic, to cortisone, then you must not use this product. If you are not sure whether you are allergic or not. You should get yourself checked out by a medical practitioner first. DO NOT RISK IT.